Qatar decision 'very disappointing' Jump to media player Premier League Chief Executive Richard Scudamore says he is "very disappointed" a Fifa taskforce has recommended that the 2022 World Cup should be held in November and December. World Cup 2022 to be played in winter Jump to media player A Fifa taskforce has suggested that the 2022 World Cup in Qatar should take place in November and December. Concern for migrant workers in Qatar Jump to media player Human rights experts express concern for the conditions facing migrant workers in Qatar ahead of the World Cup in 2022. 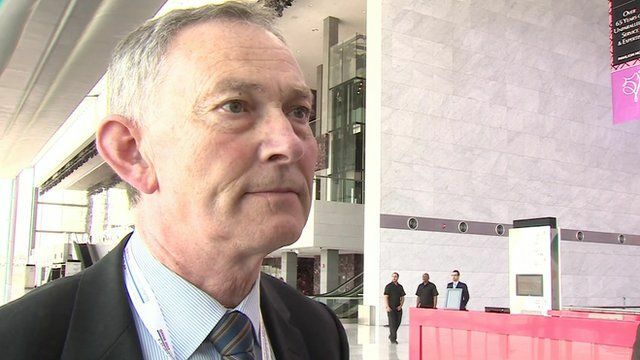 Premier League Chief Executive Richard Scudamore has said that he is "very disappointed" with the recommendation of a Fifa taskforce to hold the 2022 World Cup in Qatar in November and December. Mr Scudamore told the BBC that the European leagues felt let down, both by Fifa and Uefa.